The Pirates continued to go heavily for prep pitchers in the early part of their 2010 draft by taking Kingham. Baseball America rated him 186th overall, while PGCrosschecker ranked him 125th. According to BA, he threw his fastball in the upper-80s to low-90s, hitting as high as 94, with good movement. His size gives him very good projection. His change could become above-average, but his curve needs work. Kingham may have slipped under the radar screen just a little, because he wasn’t able to play in his junior year due to a transfer, and most scouting attention in Nevada in 2010 focused on Bryce Harper. He committed to Oregon, but signed about a week and a half before the deadline. Made a couple brief appearances in the GCL in 2010. Pitched in the State College rotation and had a very encouraging season. Opponents hit .238 against him and he walked very few. His K rate was on the low side. It says something that he won six games; the Pirates monitor workloads for high school pitchers closely at the lower levels and they often don’t last five innings. In his last ten starts he pitched at least five innings each time and never allowed more than one run. His fastball ranged from 89-94. BA ranked him the league’s 9th best prospect. Kingham pitched well in training camp, with his velocity sitting around 92-93, and seemed to be a breakout candidate going into 2012. Instead, he had a difficult season in the West Virginia rotation. He maintained his velocity well, often hitting 95, but he tended to have blowups where he couldn’t get out of an inning. He was up and down much of the season. He started off with an 8.59 ERA in April, then pitched well in May, with an ERA of 2.84. He slumped again in June to 6.28. Overall, though, he improved during the season. His ERA was 5.22 in the first half and 3.69 in the second half. It was 1.68 in his last nine starts. His peripheral numbers for the season–WHIP, walk rate and K rate–were actually good, although he had some trouble with gopher balls, allowing 15. A lot of his trouble may simply have been the need to learn to pitch out of trouble, possibly by mixing up his pitches more. The breakout that Kingham seemed ready for in 2012 happened in 2013. He spent the first half in Bradenton and dominated much of the time, to a greater extent than the ERA indicates. His stuff continued to improve, with his fastball getting into the mid-90s some of the time. His curve is a swing-and-miss pitch and he continued to improve his change. He fanned well over a batter an inning and held opponents to .212 average. The Pirates moved Kingham up to Altoona at mid-season and, despite the lower ERA, he found AA a little more of a challenge. He mostly pitched well, but occasionally had control problems. On the plus side, he allowed only one HR in AA. For the season, he had only a mild platoon split, allowing a .681 OPS to left-handed hitters and .613 to right-handed hitters. Kingham had a good, if somewhat uneven, season. He started off at Altoona and struggled with his control at times. He also saw his K rate drop some. In June, the Pirates promoted him to Indianapolis and he dominated there initially, allowing just one earned run in his first four starts. He was up and down in his last ten. Overall, he pitched better in AAA than AA. He allowed hitters a line of 234/295/347 for the season. He was a little better against right-handed than left-handed hitters, holding the former to a .601 OPS and the latter to .686. Kingham was added to the 40-man roster in the fall. He began the season in AAA with the expectation of reaching Pittsburgh at some point. His pitching in the early season was uneven, although he was striking out a lot more hitters. In mid-May, though, Kingham left a start with elbow pain and, late in the month, had Tommy John surgery, ending his season. Kingham started his rehab from Tommy John in July. 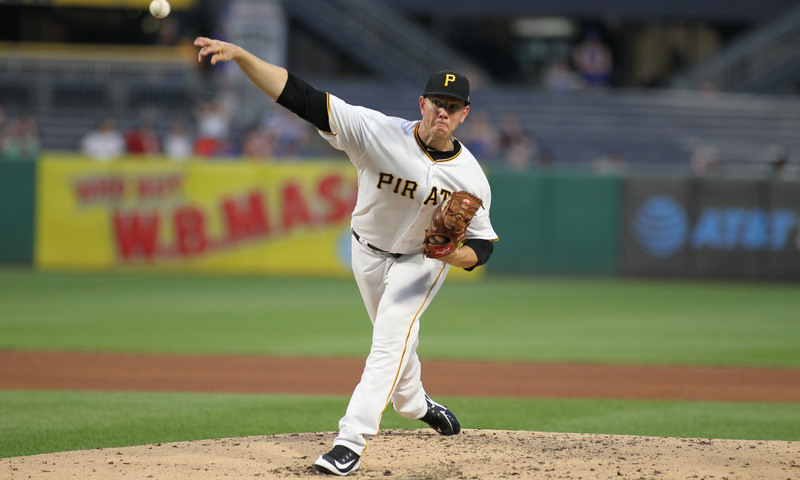 The Pirates had him work his way up to AA slowly, but he stayed healthy and showed good command. Even the high ERA in AA was the result of one bad inning when he tired at the end of an otherwise dominant start and allowed six runs. Kingham’s season got a late start due to a minor ankle injury. He got to Indianapolis in mid-May and spent the rest of the year in the rotation. He pitched well early in the year, but had a very rough stretch from early June through mid-July in which he had an ERA of 6.10. He then had a run of six outstanding starts that included one nine-inning complete game and another that he fell one out short of completing. Then he finished with two starts in which he gave up 12 runs in 8.2 IP. He had no real platoon split, but did have trouble with runners on base: opponents had an OPS of .650 with nobody on and .822 with runner on. The Pirates did not call him up in September. Due to Kingham’s missing nearly all of 2016, the Pirates were able to secure a fourth option for him. Otherwise, he’d have had to make the roster out of spring training in 2018 or go through waivers. He opened the season in AAA and got off to a great start. He started throwing a slider, which probably helped account for an increase in his K rate, which was over a batter an inning in his first nine AAA starts. The Pirates called him up in late April and he debuted with seven one-hit, shutout innings against St. Louis, with no walks and nine strikeouts. Altogether, Kingham was called up five times. Things started going badly for him in the majors, with the main problem being gopher balls. After that first start, he gave up 18 longballs in just 69 innings. Eventually, he began struggling in the minors as well. In nine starts prior to the AAA All-Star game, he had a 2.19 ERA and .195 opponents’ batting average. In his three AAA starts after that, he had an ERA of 9.00 and an opponents’ average of .397. In the majors, left-handed hitters destroyed Kingham, posting a line of 293/367/592. Kingham’s fastball velocity was down a little, to just over 92 mph on average, which could have been part of his trouble. Kingham is out of options. The Pirates stated over the winter that he’d likely be in the bullpen in 2019. That remained the case even after they traded Ivan Nova, as they handed the last starting job to Jordan Lyles. Kingham could still get a chance to start if things don’t go well with Lyles. June 8, 2010: Drafted by the Pittsburgh Pirates in the 4th round, 117th overall pick; signed on August 4. November 20, 2014: Contract purchased by the Pittsburgh Pirates.